The acanthus (Ancient Greek: ἄκανθος) is one of the most common plant forms to make foliage ornament and decoration. 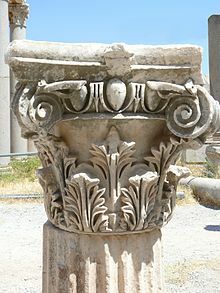 In architecture, an ornament may be carved into stone or wood to resemble leaves from the Mediterranean species of the Acanthus genus of plants, which have deeply cut leaves with some similarity to those of the thistle and poppy. Both Acanthus mollis and the still more deeply cut Acanthus spinosus have been claimed as the main model, and particular examples of the motif may be closer in form to one or the other species; the leaves of both are in any case, rather variable in form. The motif is found in decoration in nearly every medium. The relationship between acanthus ornament and the acanthus plant has been the subject of a long-standing controversy. Alois Riegl argued in his Stilfragen that acanthus ornament originated as a sculptural version of the palmette, and only later, began to resemble Acanthus spinosus. Some of the most detailed and elaborate acanthus decoration occurs in important buildings of the Byzantine architectural tradition, where the leaves are undercut, drilled, and spread over a wide surface. Use of the motif continued in Medieval art, particularly in sculpture and wood carving and in friezes, although usually it is stylized and generalized, so that one doubts that the artists connected it with any plant in particular. After centuries without decorated capitals, they were revived enthusiastically in Romanesque architecture, often using foliage designs, including acanthus. Curling acanthus-type leaves occur frequently in the borders and ornamented initial letters of illuminated manuscripts, and are commonly found in combination with palmettes in woven silk textiles. In the Renaissance classical models were followed very closely, and the acanthus becomes clearly recognisable again in large-scale architectural examples. The term is often also found describing more stylized and abstracted foliage motifs, where the similarity to the species is weak. ^ Lewis, Philippa; Darley, Gillian (1986). Dictionary of Ornament. New York: Pantheon. p. not cited. ^ Riegl, A; Kain, E (trans.) (1992). Problems of style: foundations for a history of ornament. Princeton. pp. 187–206. ^ Strong, D.E. (1960). "Some early examples of the composite capital". Journal of Roman Studies. 50: 119–128. This page was last edited on 12 February 2019, at 22:03 (UTC).